Pleasantville, New York: Reader's Digest Association, 2005. 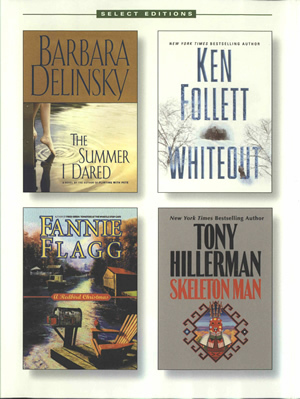 This Reader's Digest Select Editions contains a condensed reprint of Tony Hillerman's novel Skeleton Man. It was published in 2005 by the Reader's Digest Association. The dust cover is white and the front cover contains thumbnails of the four novels included in the compilation. The back contains author photos and praise from other publications. "Select Editions," titles and author names of included novels, the pegasus logo and "Reader's Digest" are printed on the spine in white on a pale green background. The inside front flap contains synopses of two of the included novels. The inside back flap contains synopses of the last two novels. The inside front and inside back covers are blank. The endpapers are cream. Binding: Dark green vinyl-covered boards. Logo embossed onto bottom right of front cover. "Select Editions," novel titles, logo, "Reader's Digest," "Volume 2 2002" lettered on the spine in gold.